When the strategies are generated, every new strategy is backtested on a history data and the results of the backtest are then used to compute the Fitness (rank) of the strategy. Fitness is number from 0 to 1 and it should reflect the “quality” of the strategy according to the given criteria. The best strategies found are continually stored into the Databank. It is not possible to store every strategy (remember that StrategyQuant can create thousands of new strategies every hour) so we must specify how many strategies should be stored in the databank, how they should be sorted to find out the best ones and which strategies should be thrown away. allows you to define whether the generation process will be terminated when databanks if full or will continue until stopped manually. Here you can choose from which data the strategy criteria will be computed and what criteria should be used to compute the total Fitness of the strategy. You can select if you want to compute fitness (strategy fitness score) from main data or from portfolio (if you use also additional data). 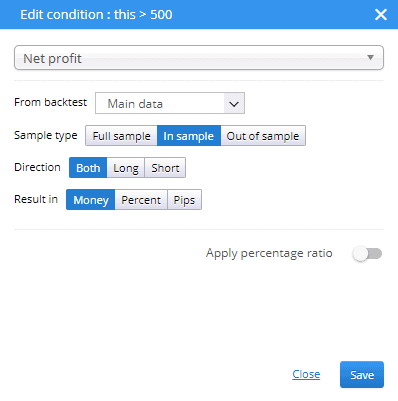 It is generally recommended to use Portfolio, then the strategy fitness will be computed from the sum of all trades across all the symbols in your portfolio. If you use this setting and you don’t have any additional data, fitness will be automatically computed from main data. You can choose from the predefined most used criteria, or you can build your own complex fitness function based on multiple criteria, each with a different weight. 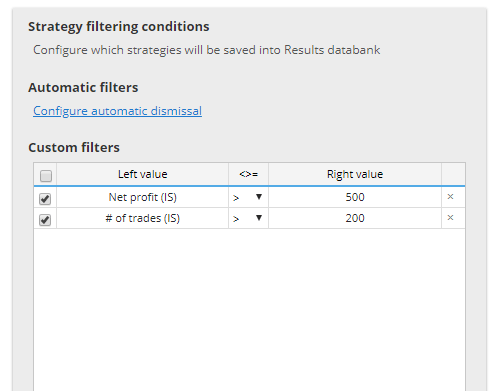 criterion to maximize Profit Factor of a strategy. You can find explanation for every ranking criteria here. you can define rules to throw away strategies with bad properties. For example it usually makes sense to throw away strategies that result in loss or these that have too little number of trades. 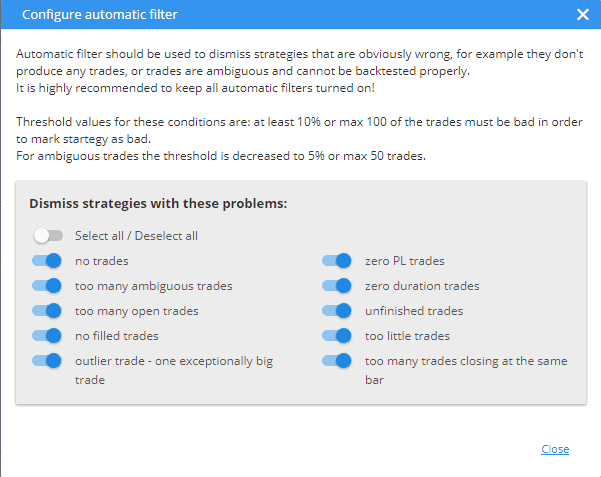 automatic filters should be used to dismiss strategies that are obviously wrong such as 0 trades strategies, strategies having no profit or strategies which have no filled orders. All the available options can be seen below. allow you to specify your own custom rules that will be evaluated for every strategy. If the strategy matches any of the rules, it will be dismissed. This is useful to quickly dismissing strategies that result in loss or with too little number of trades. There are separate values for In Sample and Out of Sample performance, and for Robustness Tests (if used) or Portfolio (if you used additional data). Results can be evaluated using Money, Percent or Pips values for either long, short or both directions.